It wasn’t the end to the 2018 World Cup that they wanted, but Belgium were in the mood for celebrations after the squad returned from Russia. Roberto Martinez’s men suffered defeat in their semi-final clash with France, but ended the tournament on a high note after beating England in the third-place playoff. Although they will have been disappointed to not go further given the quality in the current squad, it’s certainly progress for Belgium who continue to impress at major tournaments and are just missing that last step to go all the way. Perhaps the experience gained in Russia will help them moving forward with Euro 2020 in mind, but the players saw their efforts rewarded with an incredible turn out on their return to Brussels, as seen in the videos below. 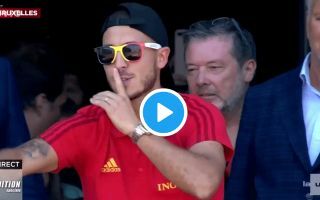 Chelsea forward Eden Hazard appeared to be enjoying the celebrations in particular, taking to the decks as a part-time DJ before leading the way with the microphone and joining in with the singing from the fans while on the open-top bus.